Although congradulations are being offered for an instant kill, the author was not pleased with his performance. As an outdoor writer, I am sometimes invited to participate on hunts using manufacturer’s products. 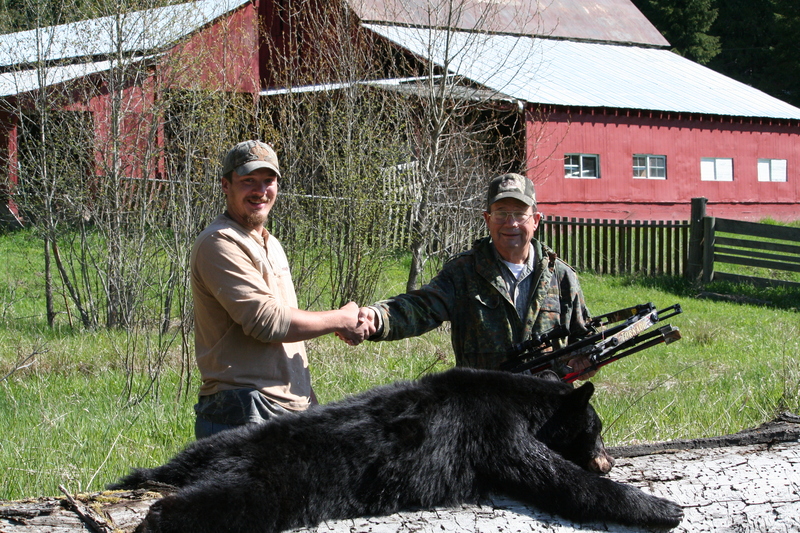 This was the case for a Spring, 2010, Idaho hunt for black bear where I had products from Buck Knives and a Parker Tornado crossbow to test. After a man-killer of a three-day drive from Georgia to Northern Idaho, I had hunted baits in two locations for eight days. A medium-sized black bear came into the bait, I had what I thought to be a small, clear shot window and took the shot. I had watched this bear when it had come in previously. It was a bit smaller that I expected, and I had passed on the animal. My hosts and I had invested considerable time and money in getting a bear. Now was the time to get the job done. I aimed at the shoulder and fired. The arrow hit an unseen limb and the solid steel point drove 4- inches into the animal’s brain, killing it instantly. This kill was due more to God’s good graces, than any skill on my part. The result was good; but my execution of the shot was terrible. You can see on the video that there is no high-fiving or carrying on after the shot. You see the expressions of a very concerned shooter, who knows that he should have waited for the bear to come to the bait barrel. Because of the very small size of the animal, under the fur, even the shoulder shot that had been attempted was no good. The heavy leg bones would have deflected the arrow from the vitals – an acceptable shot for a large-caliber muzzleloading rifle, but not for an arrow. There is an irony that I do not advocate taking head and neck shots under most circumstances, yet what may be one of my most spectacular kills was the result of a deflected arrow finding its way into this bear’s brain. This video was edited while I was on the road back to Georgia. An 8-minute video, “Backyard Bear Hunting” provides a general over-view of North American bear hunting at: http://www.youtube.com/watch?v=GSbemqFJTjQ. I think that people should only shoot and kill certain animals, the ones who we eat. I think that trophy killing is criminal. You cowardous breed of flesh!!! Before you lash out against someone whose lifestyle you do not understand, it is prudent to do your homework. If you got even a tiny bit deeper into my work you will find that I eat what I kill. Other posting describe my getting the bear meat home and my books, “Backyard Deer Hunting” and others have recipes for cooking it. Bear, in parts of North America, are abundant and hunting is the best tool to control their numbers to both prevent adverse conflicts with man as well as to increase the general health of the over-all population. O yes. People have historically and still do consume bear meat every day. If you want a professional opinion listen to the radio broadcast I did with a lady wildlife biologist from N.C. on VoiceAmerica Sports Radio on Oct. 15. Go to my website, http://www.hoveysmith.com, hit the live radio link below the banner and that will take you to the show page. Click on October and that will bring down a list of shows.